As a fresher when you see 2000 videos spanning across 60 sections you wonder "Where to start from?". So, in this small note we would like to clarify the same. If you are senior you know what you what you want , you know where to start from. For example a person who want to learn Angular will start straight form Learn Angular section , for a person who is in to BI will start from Learn MSBI section. But for a fresher its bit difficult. Learn C# step by step :- This section goes through a basic "WinForm" project and runs through important fundamentals like how to use visual studio , .NET fundamentals like CLR , CTS , GC , Delegates , events and so on. OOP Q and A videos :- This section is approx. of 4 hours and goes through basic OOP principles like Abstraction , Encapsulation , polymorphism , Inheritance , Abstract classes , interfaces and so on. Learn SQL Server :- The third section goes through SQL Server RDBMS concepts. ADO.NET Q and A videos :- In this section we discussed about datareader , dataset , connection , command and so on. Learn MVC :- This is a 16 hour videos series which creates a simple Customer project using Angular 1 and MVC 5. Learn Angular :- Angular is a great combination with server side ASP.NET MVC. This section covers both Angular 1 and 2 and 4 concepts. So now what about the other 1000 videos ðŸ˜Š. These videos bootstrap the other videos. 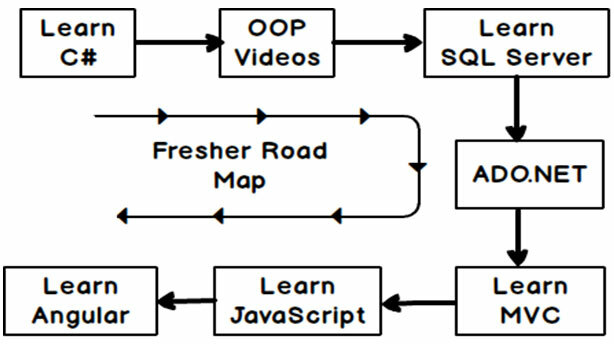 For example if you are doing Learn C# step by step between the videos we will ping you to look in to Garbage collector videos or delegate videos from .Net videos section. Once you go through the 7 sections you will get enough maturity to pick up the other sections. If you still have confusion please do email us at questpond@questpond.com we can guide in more details.